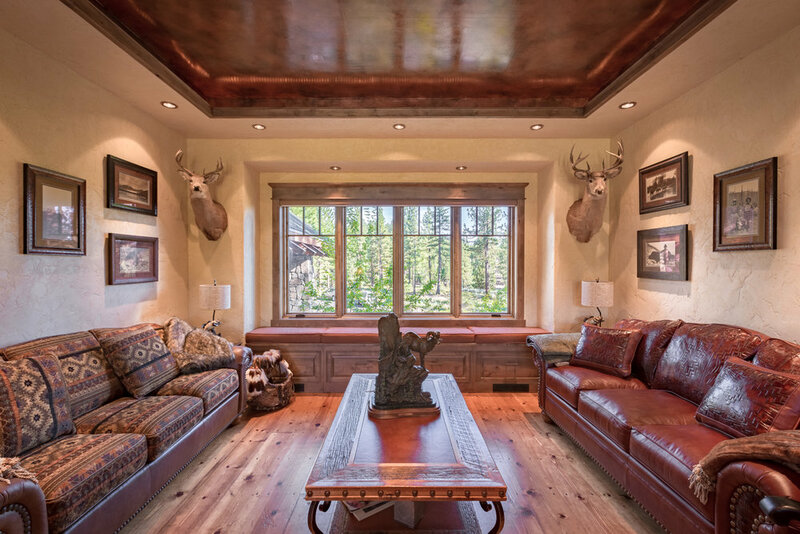 This mountain escape was designed and constructed with two master suites incorporating a family driven atmosphere. The open kitchen and great room are the focal point of gatherings. The large granite mantle in combination with the rough-cut timber trusses create a dramatic but very comfortable living space. The craftsmanship throughout the home carries over to the exterior beam work that accentuates the natural granite stone work. The modern amenities such as the two story elevator, bar area, bunk house, as well as private patio areas for each master suite make the home a perfect retreat. Whether it be a golf get-a-way or family holiday, the home provides a perfect place to relax in the High Sierra. Located on the south Peninsula of the Bay Area, our team of craftsman worked to tie the natural redwood landscape into the modern home layout. The home features pre-1900 era hand-hewn barn beams that were gathered in the high sierra, north of Lake Tahoe. The beams, in contrast to the wide-plank pine flooring help tie the natural marble lined bathrooms and painted finishes together to create a contemporary feel. The commercial grade kitchen, outfitted with state of the art appliances in combination with the 12 foot soap stone island, make for a perfect cooking space. Morning sunrises light up the kitchen and great room through the broad glass wall while looking out on the intimate pool and patio area. Sitting proudly on Grizzly Ranch’s 18th hole fairway; this 5 bedroom, 6 bath estate greets visitors with a noble entrance into the large, open great room centered around a large grand fireplace with multiple intimate sitting areas. This home features a saloon style bar room, professional grade kitchen with rotisserie barbecue, and multiple dining areas with hand-painted wall murals. Upstairs features the master suite with hidden private tap room. A large open air balcony holds the spacious office and entrance to the bunk room. The 3 story elevator accesses all levels including the bottom story with 7 car garage, large arched-brick game room, additional kitchen, bar, and wine cellar. From the wine cellar, an 80ft. tunnel leads to the corking patio with fireplace overlooking Grizzly Ranch waterfalls. The home incorporates multimedia, including intercom throughout. Perched high above the lost sierra, this home features vast views in all directions. Designed with family gatherings in mind, the home features a large open air great room and kitchen area. 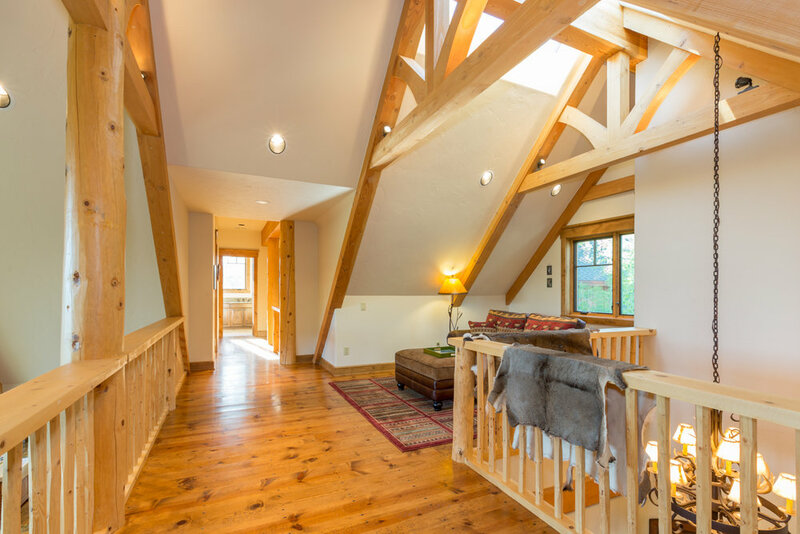 Trees harvested onsite make for stunning interior posts and beams to accentuate the distressed wide plank flooring that carries throughout the lower level. The master suite features a private fireplace with natural granite hearth and intimate sitting patio. The above garage bonus room creates a home for family game nights as well as a secluded hideout for the grandchildren. A custom wine cellar built with 100 year old barn wood accentuates the multiple sitting and corking patios.